Your sprinkler system could be operating under too much pressure–the No. 1 culprit when it comes to wasting water. Plants will not receive adequate water and you could waste thousands of gallons of water in just one growing season. That’s your money down the drain. Many homes are in areas with high or fluctuating water pressure and using the right sprinkler heads can solve these pressure problems. In industry jargon, they are “pressure regulating devices” and ideally, these are the sprinkler heads already in your irrigation system. They are available from leading manufacturers such as Hunter, Rain Bird and Toro. What does too much pressure look like? If you look at sprinklers when they are running and water appears to be misting or fogging, you have too much pressure. The sound is like the hissing you hear when you pull a nail out of a tire. With too much pressure, you could be over-delivering 1 gallon of water from every sprinkler head for every minute it operates all season long. When you do the math, that could add up to hundreds or even thousands of gallons of water. 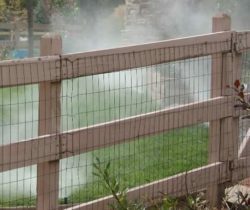 From a plant health point of view, water that comes out of the sprinklers misting or fogging won’t be delivered efficiently to the root zone of the plants. Rather than falling straight down, water evaporates or is blown away in the breeze. Some plants will be over-watered and others under-watered. If you are installing a new sprinkler system or upgrading an existing one, make sure the sprinkler heads are the pressure reducing variety. They do cost more on the front-end, but they will keep you from sending water you’re paying for down the drain. Look for products that show the EPA Water Sense label and check with your water provider to see if it offers rebates on purchases of this water-saving technology. At the end of the day, water that is not pressure regulated wastes water, wastes your money and does an inferior job of keeping your plants healthy. Implementing smart irrigation technology with pressure reducing sprinkler heads removes these wastes.